10/14 $998/wk! Spacious Gulf front condo sleeps 10-without sofa bed! Spacious, Direct Gulfront, Corner Condo Sleeps 10 ! 10/14 $998plus $145 cleaning plus 11% tax! 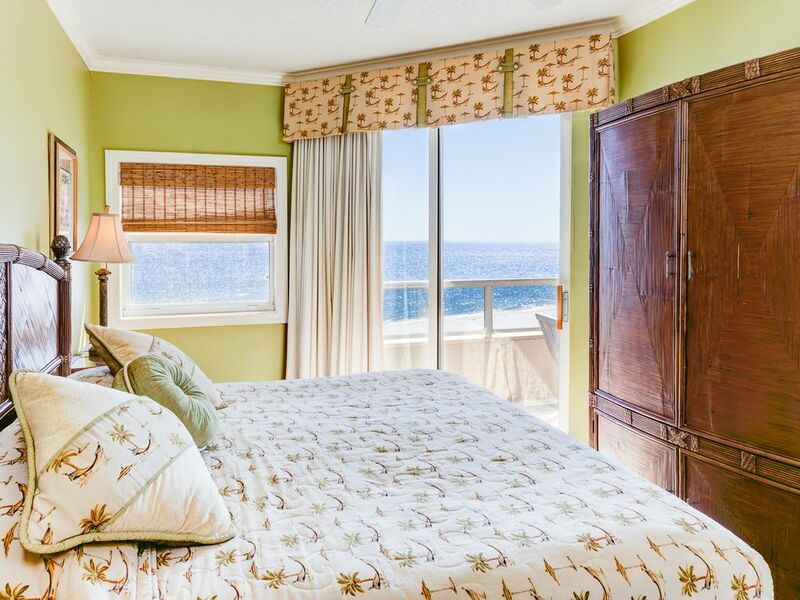 Treat and spoil your family to one of the most spacious, Luxurious, Upscale, Beachfront 3BR/3BA sought after low-density family oriented condominium in Gulf Shores/Orange Beach! • Custom Made designer fabric bedding and Down Pillows for all the 3 bedroom suites! • Espresso Machine for you to enjoy your morning cappuccino!
. One King Bed, Two Queen Beds and Two full Beds - no sleeper sofa needs for groups of 10 guest! -Well stock kitchen furnished with pancake griddle, waffle maker for cooking the flapjacks and even little details like dishtowels are from William Sonoma! -Booster high chairs, pack n play, videos, games and more! This Upscale corner, Beach front condo is absolutely flooded with sunlight for you to enjoy the breeze of the fresh salt air, the sounds of the ocean and spectacular panoramic ocean views at its very Best! Watch gorgeous and romantic sunsets from your light-filled rooms or in the wraparound balcony while you sip your favorite afternoon beverage. You can read, fish, swim, or do nothing at all. For those looking for The Best And Value… Welcome! Value For Value, This Is The Best Value Condo You Can Ever Vacation In! Email or call Now for your week in the ocean! Check out our guestbook to see what our guest says about this awesome Gulf front home. This premier family orientated condominium building are appointed with nice amenities like Oceanfront pool, heated indoor pool that overlooks the gulf and a tennis and racquetball court. This awesome condominium is a strictly 'No Smoking' unit. Policy Prohibits Rentals To Anyone Under The Age Of 25. Bedding Arrangements – 1 King, 2 Queen, 2 Full Size Bed, Sleeps 10. Amenities: indoor pool, tennis court, wet bar, custom-made bedding, superbly comfortable beds, designer fabrics, down pillows, phone, air conditioning, TV, cable TV, VCR, stereo, CD player, wet bar, full kitchen, microwave, dishwasher, refrigerator, cooking utensils provided, linens provided, washer, dryer, ironing board, iron, beach front outdoor pool, indoor heated pool, tennis and racquetball court. Families with 10 guest has no need to use sleeper sofa! Every one will be in sleeping on real beds! Very nice and well appointed condo! Furnishings are nicer than you normally get in a rental. Bedrooms are beautiful and very comfy with very nice duvets. Kitchen had everything we needed to cook meals. Would definitely book this condo again! This was a perfect place for our bi-yearly get-together. Great amenities, 3 bd/3bath was perfect. Loved the views, elevator was always "right there! ", location was close for all we wanted to do, had inside & outside pools, and two of the sisters loved using the jetted bath. Also, Veronica (the owner) is very responsive and easy to work with. Would have been plenty of space even if we brought our husbands--but this was ideal for the 3 girls! Thank you for a wonderful stay. We enjoyed our stay in Veronica’s lovely condo! The beds were super comfortable, the bathrooms were huge and so was the balcony! I really liked that The Enclave is not a big resort and it’s a quick walk to the beach! The only downside is the less than adequate parking. We were there during a less busy time and parking was only a problem on the first night we arrived. There is overflow parking across the street. Our stay was good because the location is perfect when in Orange Beach. This condo "could" be very nice, but definitely needs some deep cleaning and painting. The layout is perfect for guests, but it is not very inviting when you see all of the long time dirt in corners and the floor. We had to wear shoes/flip flops at all times, due to the floors being so dirty. We had several issues that had to be addressed while we were there, and they were handled quickly by the owner. The beach chairs that are made available to guests were completely rusted, we bought our own and left for the next guest. Our stay was not bad, just not what we expected. Thank you for taking the time to write your review. I am very sorry that your stay was not what you fully expected. I regret that the after stay review is different from the feedback I received while you were vacationing in our home. You have texted me that "All is good" about your stay. Housekeeping issues were never raised at all during your stay. I regret that I did not have the opportunity to verify and make it right for you. The entire condo has been repainted only a few months ago, as such the paint is still fresh. Regarding the beach chairs, prior to arrival, all our guest are informed to bring their own beach chairs. Like most condos, we do not supply guest with beach chairs. Our guest are however certainly welcome to use any beach chairs or toys left behind by previous guests if they choose to. Thank you for leaving your new beach chairs and thank you again for vacationing in our home. Great condo! Beds were the most comfy I’ve ever slept in. Veronica was a great host and easy to deal with. A great condo for a family vacation! We had a great trip and really enjoyed our stay. It was the perfect set-up for our family (adults, toddler, infant & grandparents). We were very glad to have the high chair/booster seat and baby items available to use to save us packing space. We also really liked the location. It was near most of the things we wanted to do and it was very close to Walmart, Starbucks, souvenir shops, the arcade, etc. We only had a few issues, but they weren’t major. A few of the electrical outlets didn’t work and we would have really liked to have a beach wagon/cart provided for use, as it was a bit of a walk to carry everything for our littles to the beach. Also, an espresso machine was mentioned in the property details, but only a drip coffee pot was available. We were pretty bummed about this! Overall, it was a great stay. We wouldn’t hesitate to book again. Unless confirmed, rates are subjected to change without notice Please check out rental agreement for rental terms Strictly no pets ( due to allergy issues ) and strictly no smoking Please add $135 cleaning and 11% tax to all rates. Fee parking for two cars Refundable Damage Deposit of $350 Note: Until confirmed, rates are subject to change without notice.